PRETTY PLEASE comment and tell me. I want to know. Because I couldn’t make up my mind. This is my last post before taking a bloggity break for about the next week and a half. That’ll give you time to catch up on these last seven (count em’ seven!) posts I’ve rolled out in just one week. I’ll have my hands full being an actress and writing which is as it should be. Amen. This recipe was inspired by a recipe from Diethood which is the opposite of a diet blog. 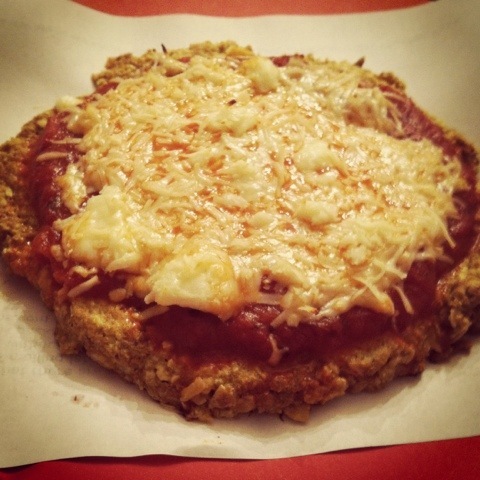 Case in point is her recipe for a deep-fried pizza sandwich. I hate the smell of fried and didn’t want to stink up my abode. I’d probably start having flashbacks of working at the gastropub-ish restaurant I was a waiter at in St. Louis, where I’d come home reeking of the “crisps” and fish n’ chips every night. All this being said I celebrated a pretty good improv show yesterday with a glass of house red and a deep-fried pickle at Bird’s, the UCB post-show hangout. Then I decided that nothin’ makes a good dessert for laughter and pickles like a fried pizza sandwich. As I stated, though, no deep-frying for moi. I made other arrangements. I took a note on the idea of coating the food with French toast batter. Then I crumbed it to get the crispy exterior a deep-fry would supply. I may post in the next week of so if the guest post I’m writing for someone comes out, but if not I’ll be back in a couple weeks with some excellent edibles and crazy cocktails. And alliteration. Peace, y’all. I’m maxed out. It’s Sunday. I’m resting. Spread bread with half the cheese, then with sauce, and then the rest of the cheese. The cheese is your sauce’s fortress to keep it from sopping into the bread, which is gonna get sopped soon enough. Top with another slice of bread. Mix egg and milk. In another bowl mix the panko, basil, oregano, and salt and pepper to taste. 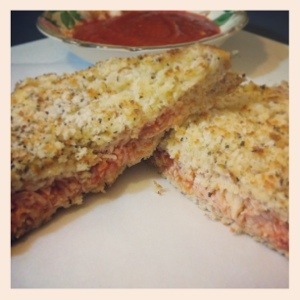 Dip sandwich in the milk mixture, then in panko mixture. Heat skillet over medium and spray with some olive oil. Fry that sucker up. Second Annual Un-Pizza Week Day Six: hey cupcake! I may be onstage as you read this! Why are you not at the theatre laughing at me? If I am funny in a forest and you are not there to laugh at me, should I laugh at myself? What qualifies a cupcake as a cupcake as opposed to a muffin? I think deep thoughts during pilot season. I think probably too much about cake. I tend to think there are three pillars of cupcake-ry. Not counting shape. Which a lot of folks do. Saying that anything in a small, cylindrical shape qualifies as a cupcake explains things like “lasagna cupcakes” and the recipe I made for called Pizza Cupcakes. 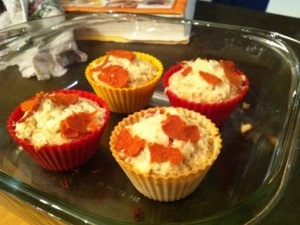 If I ran things, these wouldn’t be a pizza cupcake because I have exacting cupcake requirements. First off, there is flavor. A proper cupcake should be sweet. But sweetness is not enough, or many muffins would be experiencing crises of identity. Secondly, there must be proper texture. A cupcake must be a bit fluffier than the average muffin. I think I actually prefer muffin texture. Dense chewiness is my preference. Thirdly, there must be a frosting. Hopefully more than there is cake, in my opinion unless it is that vapid whipped frosting that is oh so bland. Give me dense buttercream or ganache or give me a muffin. I don’t really love cupcakes, even ones that meet my criteria. I would much, much rather have a big honkin’ slab of cake on a plate, with a fork that I can use to dissect it as I see fit. Much as I prefer ice cream in a dish to in a cone. Plus, a slice of cake usually has a higher frosting to cake ratio. So why on earth would I, cupcake adversary and defender of sliced cake, make these? Because they meet none of MY cupcake criteria. But they are delightful as their own thing. 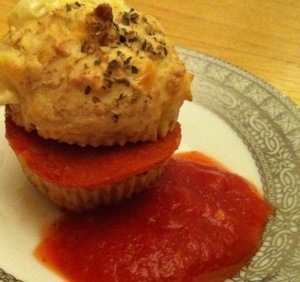 In this recipe a “pizza cupcake” is a small, textured, savory loaf topped with cheese and veggie pepperoni. I found these so-called cupcakes here. I reduced this recipe to make only a few and healthed it up a bit, baby…because if it is not dessert (for mental health) it may as well be healthy for…healthy health. Heat yer oven to 400 blistering degrees Fahrenheit and spray 4 muffin cups. Whisk together flour, bran, baking powder, sugar or stevia, and salt. Whisk in applesauce, egg, and milk until very well blended. Blend in 1 oz. cheese. Bake about 10-12 minutes. Top with remaining cheese and pepperonis. Bake several more minutes. Until it seems done. Use your senses. Your accuracy is none of my business. Have a slice of cake as dessert. My improv 401 class at The Upright Citizens Brigade (UCB) is performing this Saturday at 5:30. Student show info is here. If you come and laugh, we will be even funnier than we already were. So do that if you like. I’d like it. Smiley face. Totes adorbs pizza puffs! For realz! No please don’t, ignore that outburst it meant nothing. There is quite a theme of cuteness going on this week. Please do make these cute lil’ bundles of joy. I suggest that you make them like I did and call them pizza sliders. How 2008. These “Pizza Puffs did indeed puff. I had my suspicions they would be tough because the recipe required mixing the batter until smooth. Normally when making quick breads you don’t do that in order to avoid gluten over-development. But no, these were light and delightful and…yes, cute. I think they might not have been quite as delightful if it were not for the seasoning sprinkled atop them. They certainly would have been less pizza-y. It is almost the weekend, y’all. So go ahead and make yourself these sliders, serve em’ with some marinara to dip, crack open an ice cold beverage and get yer weekend on now. Preheat the heat monster (your oven!) to 400 degrees. Beat the flour, baking powder, almond milk, and egg until the batter is smooth as a playa’s moves. Playa as in player. Not the beach. Although sand can be pretty smooth too. Stir in the cheese. Grease miniature muffin cups or line them and grease the liners. Fill them about two-thirds full. Sprinkle with the Italian seasoning. 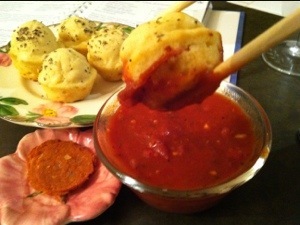 Bake about 15 minutes and serve with the pepperoni and marinara. Adorbs. Just saccherine sweet adorbs. Commitment is a frightening thing. It is hard to stand by one’s choices when they may prove controversial. It’s hard to stand by one’s recipes because if they are rejected it cuts to your soul, your essence. Alas. Sigh. Drama. Single tear. But I swear it is true! Food is an art and art is personal. But maybe one should not have to commit to certain recipes. I feel nachos are a very personal thing. Some people want even distribution of all ingredients, some prefer having one chip with more cheese, one with more veggies, and so on. Every chip different. Some love the soggy chips, some want every chip perfectly crisp. Some want a variety. I’m a variety person. People DO commit to the places they purchase nachos. I was eating exceptional nachos at a bar-restaurant in Vegas (and whilst they were good I hope never to say that sentence again), and noting our contentment the bartender asked “Aren’t those the second best nachos you’ve ever had?” and we realized he was exactly right. We inquired why he asked if they were second best and he told us everyone has their favorite nacho place and they wouldn’t let a vacation spot claim it’s nacho title. A bit of philosophy with your Vegas? 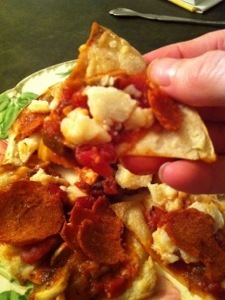 These pizza nachos were nice. And you can doctor them up as you see fit. I adapted mine from this recipe here! Here is what I made, but feel free to play and switch it up as you see fit for your taste buds. Is this a cop-out on my part? Am I not committing to my recipe for fear of it being rejected? Perhaps. I’m delicate like that. Heat oven to 400. Cut tortillas into your preferred nacho size. Spray a baking sheet with olive oil (well, that was what I did, anyway), put the chips-to-be on it and spray them. Sprinkle with salt on both sides. Bake about five minutes then flip and bake a bit more. Meanwhile, saute the vegetables, then mix in the sauce. And please do shred the cheese. Or slice. Or not. Take out the tortillas, top them the sauce and cheese and even some vegetarian (or not!) pepperoni and put em’ in the oven until the cheese is all melty and wonderful. The main requirement of this recipe is Make It Perfect. They will be the third best nachos you’ve ever had. I know I professed a distinct dislike, bordering on hatred towards the word giggle. I am sorry if I offended you and your site’s name. You do in fact make me laugh. We can agree to disagree on the worthiness of the word “giggle”. Plus you could have named your blog titter(yes I mean titter not twitter). Shake it with ice, strain, garnish with lime twist. 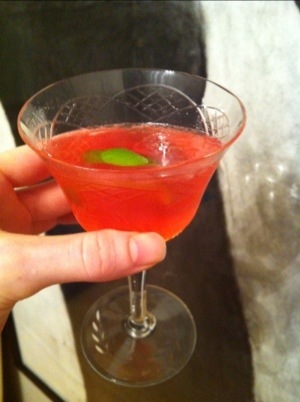 In keeping with the girliness of Hello Giggles, this drink excels in that category. It is sweet and superbly pink. Oh, god, how I agonized when to post this. Second Annual Pumpkin Week in Spring? Or Second Annual Pizza Week? If only I had waffled a slice. What week would that be? 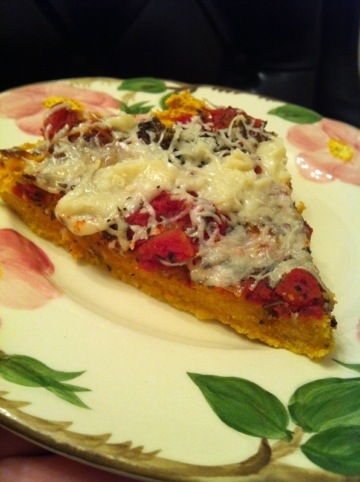 Waffle, pizza or pumpkin? We’d be REALLY confused. I really wonder about the need to categorize and document that we humans have. Why can’t I just let this food be what it is? Cause you and me are free to be…you and me. Elementary school music class flashback. Sorry. I hope that song isn’t stuck in your head now too. Geez, that was way dated even back when I was in school. I hope Jackson Park Elementary has updated their music books since then. Anyway, thank you for reading my Second Annual Pumpkin Week in Spring! I don’t have any theme weeks planned just yet. Next year there will surely be Second Annual Pizza Weeks and Waffle weeks. I may slide in recipes in those categories at other times too. Try not to panic. Mix pumpkin, sugar, egg, and applesauce. In another bowl mix cornmeal, salt and baking powder. Combine the two, then put in greased 10 inch pie pan and bake at 350 for ten-ish minutes. Sauté onion using olive oil spray adding chili powder, oregano, cumin and coriander. 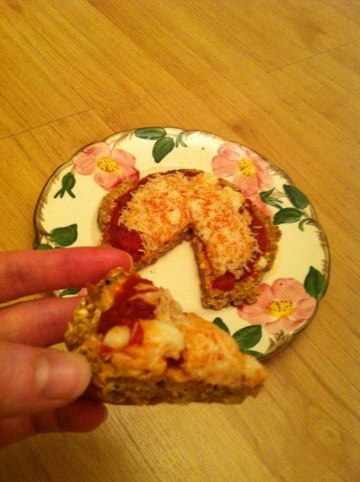 Spread on baked cornbread, spread tomato on that, then the basil, then the cheese. Bake about ten more minutes.